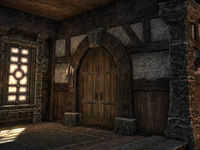 This inn has always had the reputation of being the safest place in Daggerfall for common citizens in search of illicit services to meet their shadier counterparts. The Rosy Lion is a player room in Daggerfall. It is located downstairs in The Rosy Lion, the eponymous inn found on the northern side of town. The room can be obtained for free by completing A Friend In Need with a Daggerfall Covenant character. It can also be purchased outright for a nominal fee.